Emergency Rooms vs. Trauma Care: What’s the Difference? An emergency room is designed to handle medical concerns ranging from mild but immediate (such as a sprained wrist or broken bone) to more serious issues, like being involved in a bad car accident. Trauma centers are part of the emergency room system, and are staffed and equipped for advanced care of the most complex, life-threatening emergency medical situations. 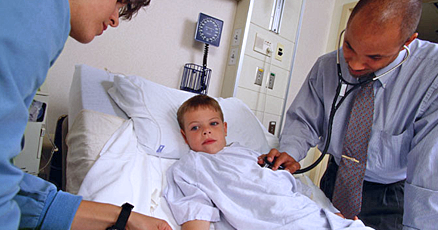 Your medical provider will recommend whether your child’s care is better addressed in an ER or a trauma center. The American Trauma Society categorizes trauma centers according to a number of factors, including how many patients are admitted each year and the types of services provided. Available resources are then verified by the American College of Surgeons (ACS). The verification process is voluntary, and takes three years to complete. Dell Children’s Medical Center is home to the Topfer Emergency Center, and our Pediatric Level I Trauma Center is one of only five in Texas. Nilda Garcia, MD, Surgeon-in-Chief at Dell Children’s Medical Center, is known as a mom, a wife, an excellent surgeon, a team player, and most of all, a compassionate warrior who cares and fights for her patients. What’s Unique About Trauma & Emergency Care at Dell Children’s Medical Center? The Topfer Emergency Center at Dell Children’s Medical Center is one of only five dedicated pediatric ERs in Texas and the only one in Central Texas. Dell Children’s houses the only pediatric-specific trauma service within a 46-county service region. Emergency room and trauma center staff are trained not only in caring for the medical needs of children but also for the emotional needs of children during the stress of injury and illness. We maintain a comprehensive trauma database to identify areas of improvement for care of the pediatric trauma patient, and where injury prevention intervention is needed. We provide pediatric trauma education for physicians, nurses and emergency response personnel throughout Central Texas. We train resident physicians and provide continuing medical education through comprehensive clinical education resources. What Is the Trauma Service? The trauma service is a multidisciplinary team of surgeons, nurse practitioners, nurses, registrars, social workers, child life specialists, injury prevention educators, therapists, researchers and support staff who work together to care for children who have suffered a serious physical injury. Our trauma service team is available around the clock to care for your injured child. You can reach Trauma Services at the Dell Children’s Medical Center Hospital, or by calling 512-324-0189. The trauma service manages the treatment of trauma patients from the moment they are admitted to the hospital through rehabilitation and entry back into their homes and communities. In this way, the trauma service ensures kids receive comprehensive care throughout their recovery. Once children are well enough to leave the hospital, the trauma service provides follow-up care through a multidisciplinary trauma clinic. The trauma service also houses comprehensive injury prevention and research programs. The Injury Prevention Program works within the Central Texas community to educate families on child safety and advocate for children at local, state and national levels. The Research Program facilitates investigation of new technologies, evaluates educational programs and drives changes in the clinical practice of trauma care. For more information, please visit Dell Children’s Trauma and Injury Research Center. Online scheduling is available at any of our Dell Children’s Emergency Care locations near you. At DellChildrensER.com, you can hold your place in line and wait at home. Arrive and be seen within 15 minutes of your scheduled time.